We are engaged in manufacturing a wide range of Polyurethane Binders. This 100% solid polyurethane resin product is moisture curing binder for onsite application of recycled rubber crumb and EPDM. 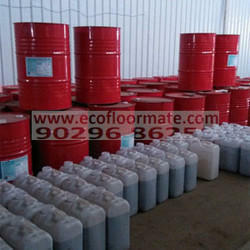 Established in the year 2010, at Navi Mumbai, (Maharashtra, India), We Ecofloormate, are a Sole Proprietorship Firm, engaged in Manufacturing and Importing an excellent quality range of Sports Flooring, Rubber Flooring, Turf Grass Flooring, Rubber Granules, etc. We are supervised under the meticulous and stern management of our Mentor “Sachin Mangalkar”. We also provide Flooring Coating Services and Flooring Services to our clients.